Code review is a very important process in software development life-cycle. It is unfortunate to realize that its also frequently ignored. A proper code review plays really significant role in quality of a software. There are many tools available to check for common coding mistakes, however a peer code review can not be avoided by use of any tool. A well defined code review process is essential to make developers life painless. 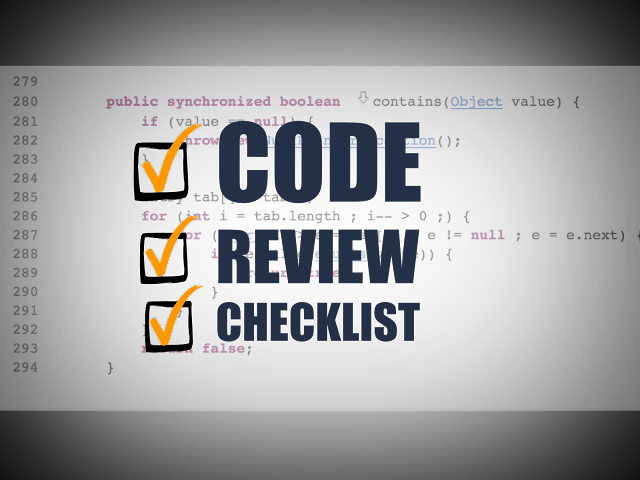 Below is a checklist that you can use to establish a code review process in your organization. Automation of mundane tasks is absolutely necessary to eliminate undesired efforts from developers. Automation play key role in driving effectiveness of code review process. There are multiple opportunity for automation in a development process. Build automation - This may sound obvious, however it is the most important step before starting to review code. Use Static Code Analyzers - Static code analyzers are programs that can identify common mistakes. Sometimes, they can reduce the burden of manual code reviews. It also promote standard coding practices. Use Code review tools for review comments and more. - These are the tools that you can use for peer code review. There are many code review tools available for free. These tools can help you keep track of code review feedback and changes. Continuous Integration tools - Continuos integration is important step in ensuring code quality for a large team. Use of static code analyzers & code coverage tools along with Continuous integration can help control code quality. There are tools that can fail the build if a specific code quality threshold is not achieved during build. Compilation of a source code is absolutely mandatory. A developer does not need to review the source code that does not compile. The first pre-requisite before you even think about starting code review. Making sure all major compiler warnings are removed. A developer must have unit tests for all code changes. Its a peer code review best practice to also review unit tests and ensure all scenarios are covered. Must have pre-requisite for starting code review. Use code coverage tools to ensure completeness of tests. Use of continuos integration tools is key in early identification of code quality issues. Any poor quality code should be immediately visible and be resolved. This avoids backlog of minor issues that never gets attention in future. Use continuous integration tools like Jenkins. Some of these peer code review best practices are already achieved during agile code review and pair programming. Peer reviews in software help reduce late identification and resolution of bugs. Below mentioned practices will help you drive effectiveness in code review. A peer code reviewer need to ensure the code is functional and performs the expected job. This may involve sitting with the developer and doing a test run and observing results. A peer code reviewer need to ensure the code has sufficient and required unit tests. Sometimes this may be difficult since the code is not unit testable. Necessary code refactoring need to performed to ensure code can be unit tested. There needs to be enough logging in the code. Code needs provide enough logging to work in debugging mode for application. There needs to be enough comments in the code. There needs to be enough monitoring related code. Writing code comments is helpful however not always necessary. Sometimes the code is not self explanatory, or does something un-usual. It needs to be well documented. All developers in a team needs to use common formatting tool with same formatting styles to avoid version control conflicts and difficulty in reading file changes. There is no right or wrong way to format code, however make sure the team uses the same formatting. Debugging information is important to support and maintain applications. Logging required key attributes makes the job of dev ops and support team easy. Developer and Code reviewer needs to ensure that all key attributes are being logged. Its common habit of developers to not remove unused code from a file. This is mainly since they think it may be required in future. Some developers tend to comment it so it can be used later. This makes the code unreadable. The code reviewer must make sure that all such code is removed. Developers can always go back to a previous version of code in version control. However, in my observation, a commented code is almost always not reused. Not handling NULL and Empty objects causes many production related problems. A code reviewer must be explicitly watching for these issues. Unit test cases should also be addd to check for all NULL and Empty object scenarios. A software needs to follow consistent coding practices. There are coding standards available in almost any programming language. Stick to the standard coding practices to ensure everyone speaks the same language. It makes it easier for a new developer to start understanding the code faster. Many configurations are often hard coded by developers inside the compiled code and makes it difficult to change the behavior of software. For example an optional feature should have a configuration that can enable or disable a feature. I code reviewer my look for such opportunities to ensure configuration is preferred over hard coding. Performance of the code is important, however difficult to measure depending on type of software. Its important that a code reviewer looks at the performance of a code in various aspects. Time to do the task - How much time it take to finish the task. Is it acceptable? Memory or Number of objects used to do the task. Is it acceptable? Number of threads or processes to do the task. Is it acceptable? Scalability of the code may be a important concern, depending on your requirements. Its important that a code reviewer looks at the scalability of a code in various aspects. Will the current software scale with new changes. Will there be any impact on scalability in future. Never log sensitive information on log files, it can be dangerous and make hacking easy. Disable Weak Ciphers on your app/web servers. Use trusted libraries for cryptography and encryption instead of inventing your own. Watch for OWASP top 10 issues are addressed in a web facing application. Releasing of resources after the task is completed successfully. Releasing resources after the task has failed. Release resources after there is exception in processing task. Copy/Paste is developers best friend. Many lines of code is duplicated by simply doing a copy paste. This seems to solve problem in short term however creates maintenance issues in long run. Any copy/paste candidate in code must be refactored to be re-usable. It needs to be done carefully since many other code blocks may be calling it already. Most of the developers are not writing multi threading code and concurrent applications. Therefore these aspects are often ignored by developers. You must pay careful attention to your code block and understand its behavior when multiple thread will try to access it at same time. Ensure all shared variables are minimized and handling concurrency of multiple threads is not leading to a potential deadlock situation. It is not easy to spot a design pattern in a bad code, however an experience programmer can easily suggest a better approach provided enough knowledge of the software. Try to spot common design pattern application on existing code and see how you can improve it. Use of design pattern improves maintainability of source code. Hope you will find these code review best practices useful. Try to implement it in your everyday development process and observe a guaranteed improvement in the software quality.